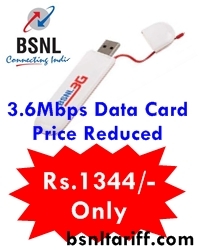 Bharat Sanchar Nigam Limited (BSNL) has announced Discount sale price offer on 3G 3.6Mbps Data cards under 3G services. The BSNL Competent Authority has offers and reduced 3.6Mbps Data card price to Rs.1344/- (All inclusive of taxes) across Tamilnadu Telecom Circle. The above special reduced price on 3G data card will be available across Tamilnadu Telecom Circle and also Chennai Telephones under promotional basis for a period of 57 days. The above offer will be implemented and with effect from 03-02-2013 to 31-03-2013.